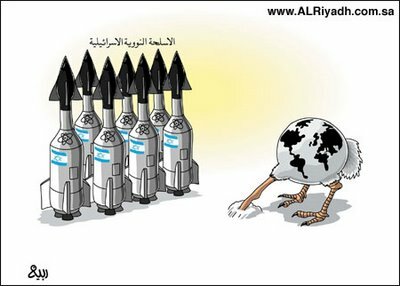 It will be very interesting to see how Israel weasels out of this one ~ another public relations challenge to be dealt with. Of course despite the legitimacy of the members of NAM it is very possible, indeed most likely, that the country will attempt to ignore this call and accuse Iran of some crime or another. The 120-nation Non-Aligned Movement on Friday demanded that Israel join the nuclear Non-Proliferation Treaty without precondition and further delay. Iran assumed the rotating presidency of NAM for a three-year term on August 30, 2012. I am honored to speak on behalf of the Non-Aligned Movement. The Convention on the Suppression of Acts of Nuclear Terrorism reflects the success of multilateralism to which NAM attaches great importance. The movement values this opportunity to express its views on this subject of contemporary interest. NAM strongly and unequivocally condemns as criminal and rejects terrorism in all its forms and manifestations as well as all acts, methods, and practices of terrorism wherever, by whomever, against whomsoever committed, including those in which states are directly or indirectly involved, which are unjustifiable (no matter what) considerations or factors… may be invoked to justify them. NAM expresses its satisfaction with the consensus among states on measures to prevent terrorists from acquiring weapons of mass destruction. NAM welcomes the adoption by consensus of the General Assembly Resolution 66/50 entitled “Measures to prevent terrorists from acquiring weapons of mass destruction” and underlines the need for this threat to humanity to be addressed within the UN framework and through international cooperation. While stressing that the most effective way of preventing terrorists from acquiring weapons of mass destruction is through the total elimination of such weapons, NAM emphasizes that progress is urgently needed in the area of disarmament and non-proliferation in order to help maintain international peace and security and to contribute to the global efforts against terrorism. NAM calls upon all UN member states to support international efforts to prevent terrorists from acquiring weapons of mass destruction and their means of delivery. It also urges all member states to take and strengthen national measures, as appropriate, to prevent terrorists from acquiring weapons of mass destruction, their means of delivery and materials and technologies related to their manufacture. While noting the adoption of resolution 1540 (2004), resolution 1673 (2006), resolution 1810 (2008) and resolution 1977 (2011) by the Security Council, NAM underlines the need to ensure that any action by the Security Council does not undermine the UN Charter and existing multilateral treaties on weapons of mass destruction and of international Organizations established in this regard as well as the role of the General Assembly. NAM further cautions against the continuing practice of the Security Council to utilize its authority to define the legislative requirements for member states in implementing Security Council decisions. In this regard, NAM stresses the importance of the issue of non-state actors acquiring weapons of mass destruction to be addressed in an inclusive manner by the General Assembly, taking into account the views of all member states. The NAM emphasizes the need to improve national, regional, and international preparedness and response to nuclear accidents and calls for a strengthened role of the IAEA in emergency preparedness and response, including through assisting member states, upon their request, on emergency preparedness and response to nuclear accidents, promoting capacity building, including education and training in the field of crisis management. The NAM underlines that measures and initiatives aimed at strengthening nuclear safety and nuclear security must not be used as a pretext or leverage to violate, deny, or restrict the inalienable right of developing countries to develop research, production, and use of nuclear energy for peaceful purposes without discrimination. NAM affirms the need to strengthen the radiological safety and protection systems at facilities utilizing radioactive materials as well as at radioactive waste management facilities, including the safe transportation of these materials. The movement reaffirms the need to strengthen existing international regulations relating to safety and security of transportation of such materials. The primary responsibility for nuclear safety and nuclear security rests with the individual states. In that sense, NAM underlines that the states with nuclear power programs have a central role in their own countries in ensuring the application of the highest standards. NAM also emphasizes that the IAEA is the sole intergovernmental organization within the UN system with the mandate and expertise to deal with the technical subjects of nuclear safety and nuclear security. NAM reaffirms the inviolability of peaceful nuclear activities and that any attack or threat of attack against peaceful nuclear facilities – operational or under construction- constitutes a grave violation of international law, principles and purposes of the UN Charter and regulations of the IAEA. NAM recognizes the urgent need for a comprehensive multilaterally negotiated instrument prohibiting attacks or threat of attacks on nuclear facilities devoted to peaceful uses of nuclear energy. NAM stresses its concern at the threat to humanity posed by the continued existence of nuclear weapons and of their possible use or threat of use. NAM reaffirms that the total elimination of nuclear weapons is the only absolute guarantee against the use or threat of use of nuclear weapons. NAM reaffirms its principled positions on nuclear disarmament, which remains its highest priority, and on the related issue of nuclear non-proliferation in all its aspects. NAM stresses the importance that efforts aiming at nuclear non-proliferation should be parallel to simultaneous efforts aiming at nuclear disarmament. NAM emphasizes that progress in nuclear disarmament and nuclear non-proliferation in all its aspects is essential to strengthening international peace and security. NAM reiterates deep concern over the slow pace of progress towards nuclear disarmament and the lack of progress by the Nuclear-Weapon States (NWS) to accomplish the total elimination of their nuclear arsenals in accordance with their relevant multilateral legal obligations. The movement reaffirms the importance of the unanimous conclusion of the ICJ (International Court of Justice) that there exists an obligation to pursue in good faith and to bring to a conclusion negotiations leading to nuclear disarmament in all its aspects under strict and effective international control. In this regard, NAM underscores the urgent need to commence and to bring to a conclusion negotiations on comprehensive and complete nuclear disarmament without delay. NAM reaffirms the importance of the application of the principles of transparency, irreversibility, and verifiability by the NWS in all measures related to the fulfillment of their nuclear disarmament obligations. Pending the total elimination of nuclear weapons, NAM reaffirms the need for the conclusion of a universal, unconditional, and legally binding instrument on negative security assurances to all NNWS as a matter of high priority. NAM urges the UN Secretary General and the co-sponsors of the 1995 Resolution on the Middle East, in consultation with the states of the region, to exert utmost efforts in ensuring the success of the Conference to be convened in 2012, to be attended by all states of the Middle East on the establishment of a Middle East zone free of nuclear weapons and all other weapons of mass destruction. NAM stresses the need to avoid any further delay in convening this Conference. 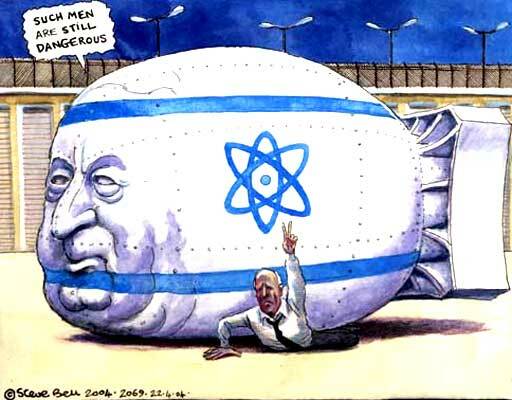 NAM also demands (that) Israel, the only country in the region that has not joined the Treaty on the Non-Proliferation of Nuclear Weapons (NPT) nor declared its intention to do so, to renounce possession of nuclear weapons, to accede to the NPT without precondition and further delay, and to place promptly all its nuclear facilities under the International Atomic Energy Agency (IAEA) full-scope safeguards. NAM reiterates that the issues related to proliferation should be resolved through political and diplomatic means, and that measures and initiatives taken in this regard should be within the framework of international law, relevant conventions, and the UN Charter, and should contribute to the promotion of international peace, security, and stability. Mindful of the threat posed to humankind by the existing weapons of mass destruction, particularly nuclear weapons and underlining the need for the total elimination of such weapons, the movement reaffirms the need to prevent the emergence of new types of weapons of mass destruction, and therefore supports the necessity of monitoring the situation and triggering international action as required. Finally, on behalf of the movement, I express the hope that the secretary general will duly reflect these views in his summary of today’s proceedings as well as the views of member states. Any possible follow-up should be inclusive and member state driven. 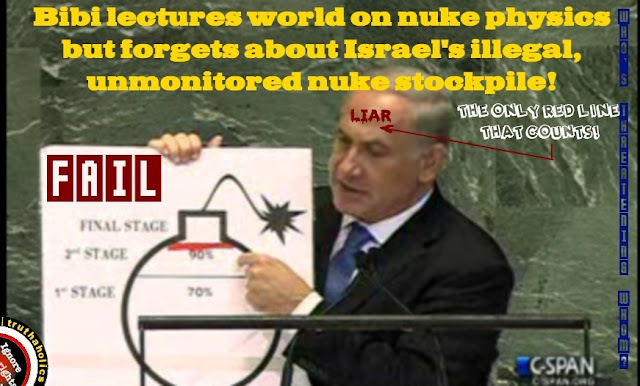 Yes, it will be interesting to see how IsraHELL squirms out of this, but you'll never see this on the Zionist MSM.